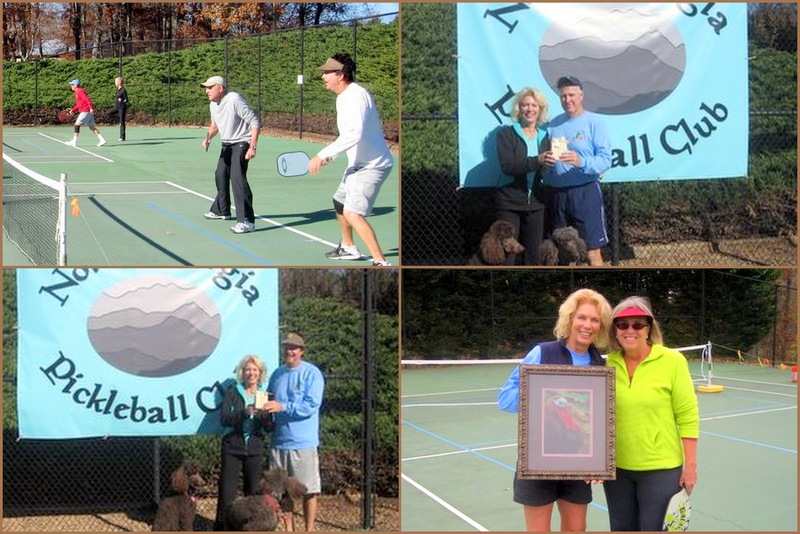 The Great Pumpkin Tournament was held on November 17 and 18 on the courts of the North Georgia Pickleball Club in Canton, GA. The Saturday Opening Ceremony was provided by the Teasley Middle School Jr. ROTC Air Raiders. A short presentation by The Rifle team was followed by the presentation of the flag and a reenactment of the Imo Jimo Memorial. A $250 check was presented to their Commander Santiago Santana. Pastor Ken Terrell sang the National Anthem and play began! Anne Early (along with Atlantic South mascots, Bocce and Clyde) present the awards to the winners in front of their new North Georgia Pickleball Club Banner donated by Floyd Moody Graphics. Floyd Moody topped the Charlie Brown division and Pat Denman came out first in the Lucy division. Over $1500. was raised for the Cherokee county Humane Society. Pictured is Ottis Moore with his rescue long-haired Dashund puppy accepting the checks from Tom Earley. Ottis has been past President and Board member plus he orchestrates the weekly adoption at PetSmart. Despite a cool beginning, the day was clear and spectacular! Play continued on Sunday. Another cool day on the courts, but another very good pickleball day. Top place in the Snoopy Division was Don Lucas, and joining him in first place from the Linus Division was John Pyle. Also on the court last week was artist Katie Brown who honored Ann Early. Pictured above she is presented with a painting of a heritage turkey (just like the ones she and Tom raised a couple of years ago) as a "thank you" for their work on the tournament. Well deserved Tom and Ann! All the pictures from the tournament have been added to the GA Photo Gallery.